Dimensions: 21" x 14.75" x 1"
I love the design. It is simple, attractive and effective. This works well. My only gripe is that I have to hold it up and rinse it off periodically. Silicone mats are the foundation of the dish drying solutions from the team at Ta-Da, led by founder Chris Shipton. Silicone dries faster, stays cleaner, and is flexible and durable. 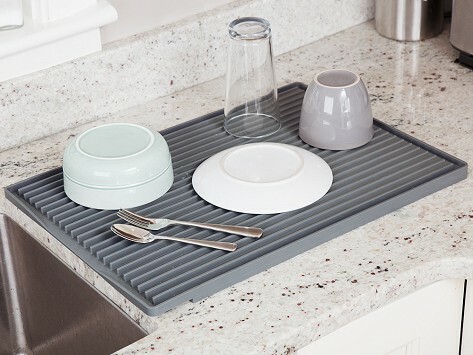 Silicone mats are the foundation of the dish drying solutions from Ta-Da. The sturdy over-the-sink rack combines a rinsing and drying solution in one. It works just as well for washing things like veggies as it does for dishes, and rolls up when you’re done. The self-drying mats are built to promote better air flow and keep your surface puddle-free. Top one off with the sleek dish rack made from rust-proof aluminum to do the drying task without taking up tons of counter space. Or shield your sink from dings and scratches with the sink protector that also has a waved design to help direct water runoff for faster draining. When dish duty is over, the silicone mats can all go through the dishwasher and store away easily until next time.